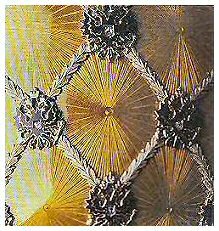 Details of the beautiful Coronation Egg, the crown on top of the coach, the coach as it fits in the Egg, a close-up of the "guilloche" and the date on the bottom of the Egg. 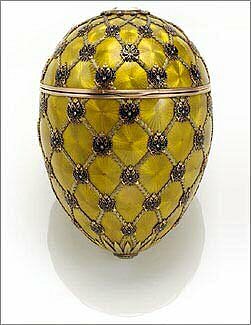 The 1897 Coronation Egg is made of varicolored gold, translucent lime-yellow and opaque black and blue enamel, diamonds and off-white velvet lining. 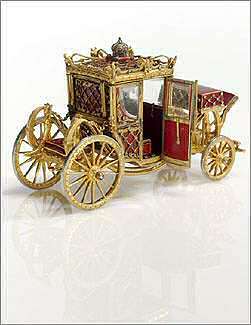 The surprise, the coach, is made of gold, platinum, strawberry red enamel, diamonds, rubies and rock crystal. The now missing surprises are a pendant, emerald or diamond, a display case made of jadeite, silver-gilt and cut-glass and a stand made of silver-gilt wire. 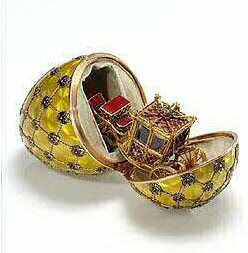 The superb red gold Egg is enameled a deep gold hue over guilloche sunburst patterns and blanketed by a gold trellis marked by diamond-set Imperial eagles at the intersections. At the top of the Egg is the crowned monogram of Tsarina Alexandra Feodorovna emblazoned in rose-cut diamonds and rubies. 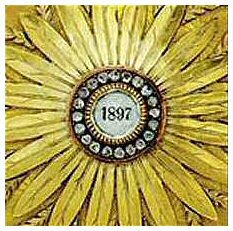 The date 1897, appears beneath a smaller portrait diamond at the bottom of the Egg. 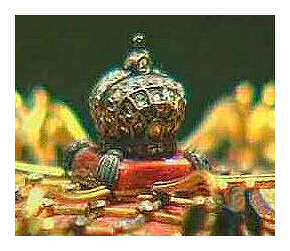 The color scheme of the Egg was drawn from the cloth-of-gold Coronation Robe worn by the Empress. 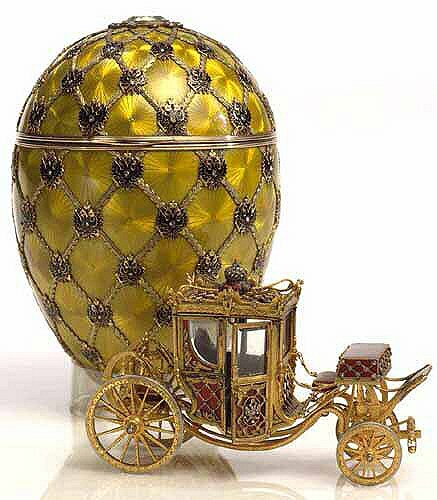 The Egg opens to reveal a removable miniature replica of the Imperial coach used by Alexandra Feodorovna on her entry into Moscow to her coronation at the Uspensky Cathedral the year before. Complete with moving wheels, opening doors, actual C-spring shocks, and a tiny folding step-stair. Inside the coach originally hung a diamond or emerald pendant. The Egg was delivered, together with a glass-enclosed jadeite stand for the display of the Carriage. (now missing). The accurate and highly-detailed coach took 15 months to fabricate, and was created by George Stein. Red lacquer and upholstery of the original coach (made for Catherine the Great) was recreated using red enamel and the blues of the interior were also faithfully reproduced in enamels. The gilt coach frame was reproduced in gold, the iron wheel rims in platinum, and glass windows in etched rock crystal. The coach is surmounted by an Imperial crown with rose diamonds. This Egg commemorates the coronation of Nicholas II and Alexandra Feodorovna in Moscow's Uspensky Cathedral on May 26, 1896. The celebrations, however, turned to disaster the next day, when hundreds died and thousands were injured in a stampede for free beer and coronation souvenirs at Moscow's Khodynka Meadow. Nicholas II followed poor advice from his uncles and that night attended a glittering ball organized by the French ambassador. Ordinary Russians were appalled at what appeared to be a disregard of the day's terrible events. Superstitious Russians did not regard it as a good start to the new reign. This Egg, maybe because of these events, was definitely not one of Alexandra's favorite Eggs. In 1927 one of nine Imperial eggs sold by the Antikvariat, to Wartski. In 1934 it sold to Charles Parsons, back after the war in 1945 by Wartski. 1979 sold together with the 1898 Lilies of the Valley Egg, to Malcolm Forbes of the Forbes Magazine Collection. February 2004 sold by the Forbes' family to the Vekselberg Foundation/The Link of Times Foundation, Russia.